New Delhi, April 11: As the seven-phase Lok Sabha elections began on Thursday, the government hinged on Shah Rukh Khan's star power to exhort the electorate to exercise their franchise in the maximum numbers. The Press Information Bureau (PIB), the publicity arm of the Ministry of Information and Broadcasting, used stills from Shah Rukh Khan-starrer Mohabbatein to send out the message emphasising the importance of voting in a democracy to build a better future. 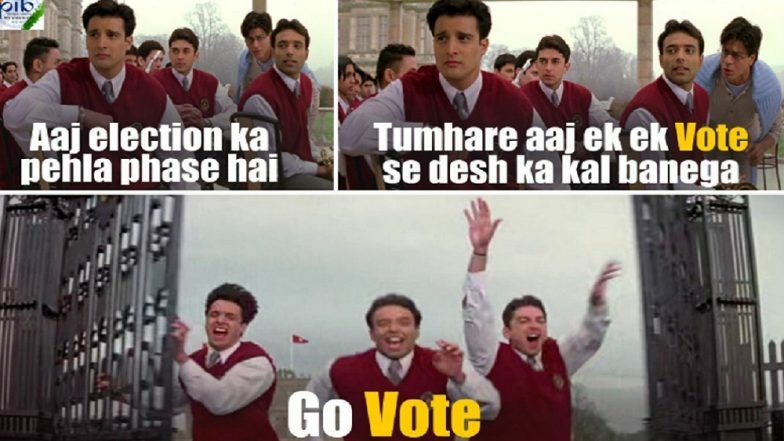 The PIB posted on its Twitter handle a montage of three visuals from a scene featuring Shah Rukh, Uday Chopra, Jugal Hansraj and Jimmy Sheirgill along with the message: "Aaj election ka phela phase hai... Tumhara aaj ek ek vote se desh ka kal badlega...Go Vote (Today is the first phase of elections. Every vote counts for the nation to change. Go vote)." Petrol, Diesel Pump Owners to Give 50 Paise Per Litre Discount to Voters With Inked Fingers on Polling Day. It added: "Ballot is a power, distributed equally among all Indians. Lok Sabha Elections 2019 begin today. Let's claim our equal stake in the future of India. Go Vote... It matters." In the film, the scene was about Shah Rukh convincing the students of the fictional educational institution 'Gurukul' to follow their heart and let it free. The Aditya Chopra directorial, which failed at the box office, still holds a special place in the hearts of Shah Rukh's fans, especially for its songs and for bringing SRK and Amitabh Bachchan together in the same frame.